The Gripper is a device that enables the surgeon to apply the retractors in any way, with stability and no additional help from an assistant. This will help in hospitals with staffing issues and will also alleviate the need for the assistant to hold a retractor for long periods of time. Where there is a need for an assistant, it will free them up to help the surgeon in other aspects of the surgery. This makes it an ideal tool to aid in training, as the assistant can fully visualise what the surgeon is doing, rather than being limited by the position adopted to hold the retractors. The Gripper® is the assistant that is available 24/7 for all pathologies, both for scheduled and trauma cases. The Gripper® makes it possible for surgeons to operate with fewer people in the operating room. This means fewer handlings which could cause sterilisation problems in the surgical area. The Gripper® ensures accurate and stable placement of the retractor. This means the surgeon always has an optimal view of the surgical area. The surgeon places the Gripper® with the correct pressure so that the retractor can be positioned accurately and stable. The Gripper® remains stable in its position even under the most demanding circumstances. There is a smaller risk of damage because it is the surgeon who determines the pressure on the bone and soft tissue. The retractor is then able to follow the movements dynamically during the operation, which leads to a reduced cutting effect on the soft tissue. During a fluoroscopy the retractor does not need to be put in and removed from the wound, which also means less damage to the soft tissue. 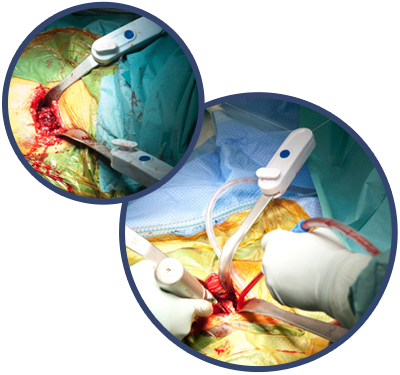 The Gripper® gives the surgeon complete control of positioning the retractors. The assistant is now free to perform other activities more befitting to his/her level of training. This greatly improves the ergonomics for the surgeon and the personnel in the OR. The surgeon can focus 100% on the patient during the operation without the distraction of others which decreases the risk for complications. Using the Gripper® gives the surgeon more control over the procedure and makes it possible to repeat the process. The standardisation that results from using the Gripper® leads thus to better cost management.